later still OH3FK. I made first ever OH - VP9 contacts! It was more than we expected. Coming to distant place from home and working home on six was unbelievable. Our trip to Bermuda ended on May 13th - not a single beep from any other EU -stations during our stay. I would like to say: Mission Achieved! More at: oh1vr.net and PDF of the event available here. Thank you very much for your great hospitality during my five days stay in Bermuda. Operating from your site was again a pleasure: Huge Pile up's on all bands with 100 watts. Total: 3400 q's - over 1000 q's on 160 mtrs was more than I expected. from your QTH (3rd and 2nd in the World in my class). It seems that this time my 881 q's and the score about 0,5 million points will be enough for the place among top six scores. I can say: The aim was achieved! This was a good start for my '50 years as OH1VR' mini dxpeditions series. Thank you very much for your great hospitality during my first - not last - visit to Bermuda. 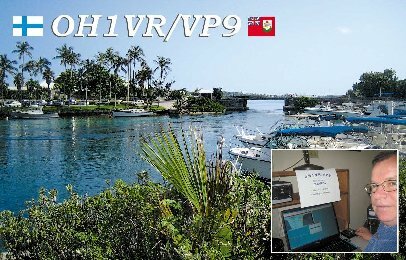 My OH1VR/VP9 - operation produced total 1626 QSO's in 18.5 hours. Almost 1500 of q's were on CW and some 100+ on SSB. on 10 MHz 400+ and on 7 MHz some 100+. 9 % to Asia (e.g. more than 100 JAs). South America, Africa and Pasific only about 1 % of QSO's. 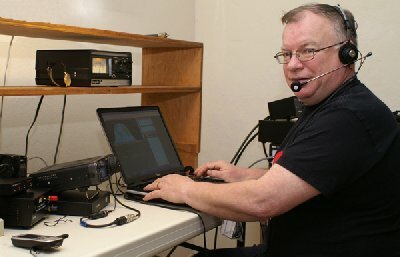 I visited Bermuda for the first time in my life August 2007, second time three months later for CQ WW CW in November and third time...soon again. on and started the operation. This e-mail is also my tentative new reservation for 2008 CQ WW CW! More about it later. I thank you very much for the good care taking. You made our trip to successful.